Aintree Racecourse has without doubt some of the finest Hospitality facilities in the Country. With private Boxes and top class viewing Restaurants there is something for everyone at Aintree. As well as Grand National steeplechase, the other events are spread throughout spring, summer and autumn. With additional entertainment from live music to spooky Halloween themed race days, a day at Aintree certainly will be a memorable one. Racing at Aintree has taken place since 1839, so not only is the Merseyside racecourse steeped in history and tradition, but there are lots of exciting new developments too. With a new Parade Ring, Weighing Room, and two new state of the art grandstands, a day out at Aintree delivers a 21st century racing experience like no other. 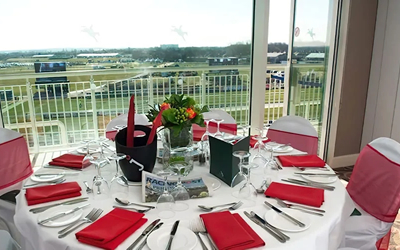 With Private Boxes available in the Lord Sefton Stand and wonderful viewing Restaurants, Aintree can cater for all occasions whether it be Corporate entertaining or smaller gatherings with Family and friends. Whatever type of Hospitality, size of your party or budget we are sure to have the packages to suit your requirements at Aintree Racecourse. Why not get in touch with us today and you can be assured of great service and advice.